Most productivity tips and practices encourage people to focus on 3 big projects to get done every day. And if you have some smaller tasks that need to be completed, it may be more helpful to roll them into one bigger task (though maybe not one of your 3 for the day), and just chip away at them at the same time. But then how does that look when you’re planning your day? 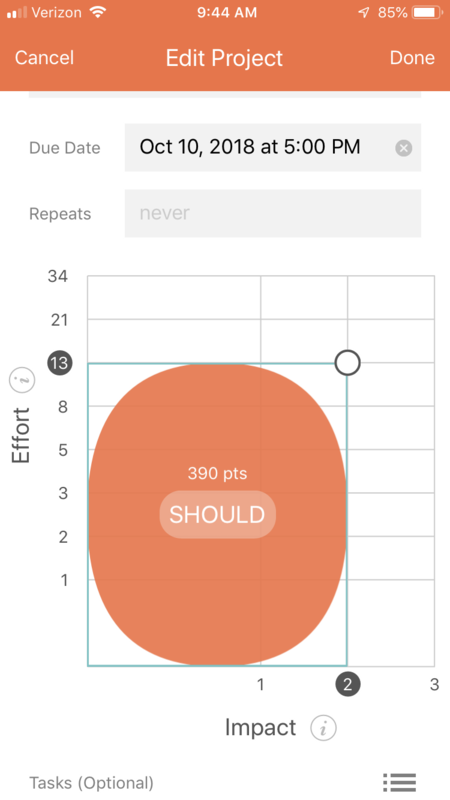 With The Arena App, every project you enter will be added on a scale of impact and effort. The best part? You get to say how much (or how little) effort and how big (or small) of an impact the project has when you enter them in for the day. 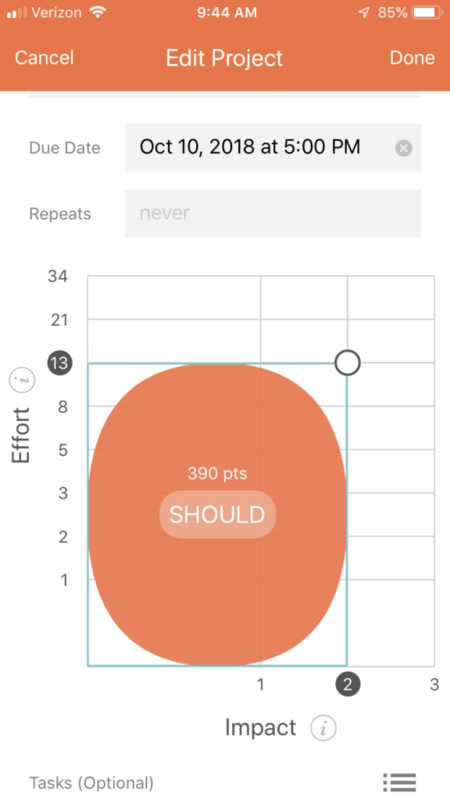 The size of your bubbles will reflect the value placed on your tasks, and each task will then receive a point total. 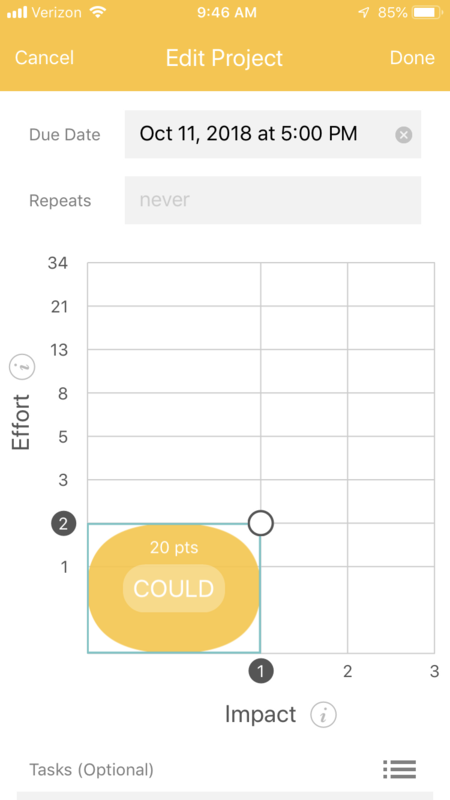 The higher the impact and effort, the more points a project is worth – and more points toward your Accomplishments bar once you complete your task! Some people use this scale as a motivation tool for not only completing the project but sometimes just for starting it. If the project is not something you particularly want to do or are having trouble starting, increase the point total. Getting that high point total at the end of the day feels great, and knowing that you knocked out a big (or unpleasant) project along the way can make it even better! To help with the impact vs. effort decision, each project also comes with the option for Must, Should, or Could complete it today, which can also help you decide what to work on and when to work on it. 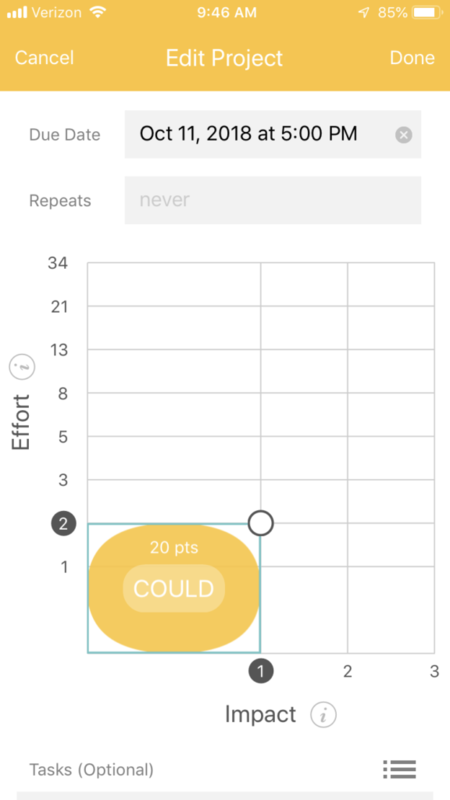 For example, your 3 big tasks for the day would have higher point totals and the Must label. If you have smaller tasks, enter them in accordingly (or all as one, with a checklist to keep track of what you have completed), and choose either Should or Could so you know that not completing them won’t throw your whole day off. The most important thing to remember when choosing impact vs. effort, and if you Must, Should, or Could complete a task is that you are the one who makes the decision. It’s all up to you – sure, maybe you have a deadline for your budget report (Must, 320 points), but once you complete it, you’re on your way to finishing your day strong. The appeal of Arena is that it doesn’t tell you what to do; it helps you focus more on what you know you need to do, which allows you to be in control of your day. Let The Arena App help you win the day, and gain the peace of mind that you did everything you could in the time you had.